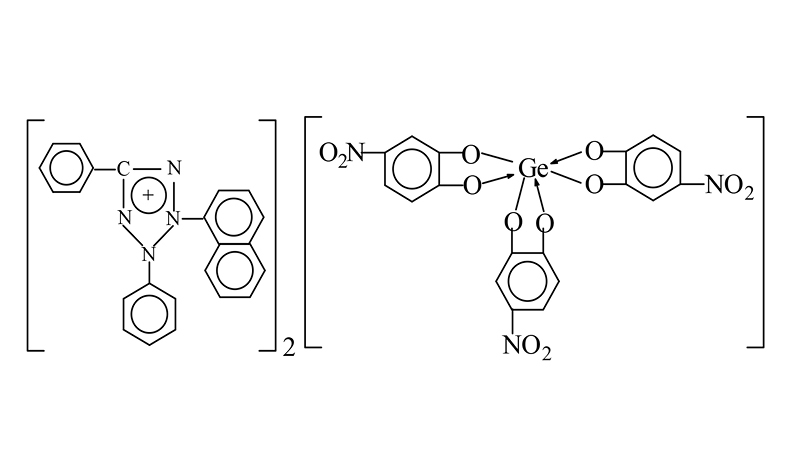 The formation of an ion-associated complex between of the anionic chelate of germanium(IV) with 4-nitrocatechol (4-NC) and the cation of 3-(2-naphtyl)-2,5-diphenyl-2H-tetrazolium chloride (TV) was investigated by spectrophotometry. The optimum conditions for the chelate formation and the extraction of the complex in the liquid-liquid extraction system Ge(IV)‒4-NC‒TV‒H2O‒CHCl3 were established. The validity of Beer’s law was checked and some analytical characteristics were calculated. The association process in the aqueous phase and the extraction equilibria were studied and quantitatively characterized by the following key constants: association constant, distribution constant, extraction constant and recovery factor. The molar ratios of the components in the ion-associated complex were determined by independent methods. Based on this, a reaction scheme, a general formula and a structure of the ion-associated complex were suggested.